A Musical tribute in Song to Rev. 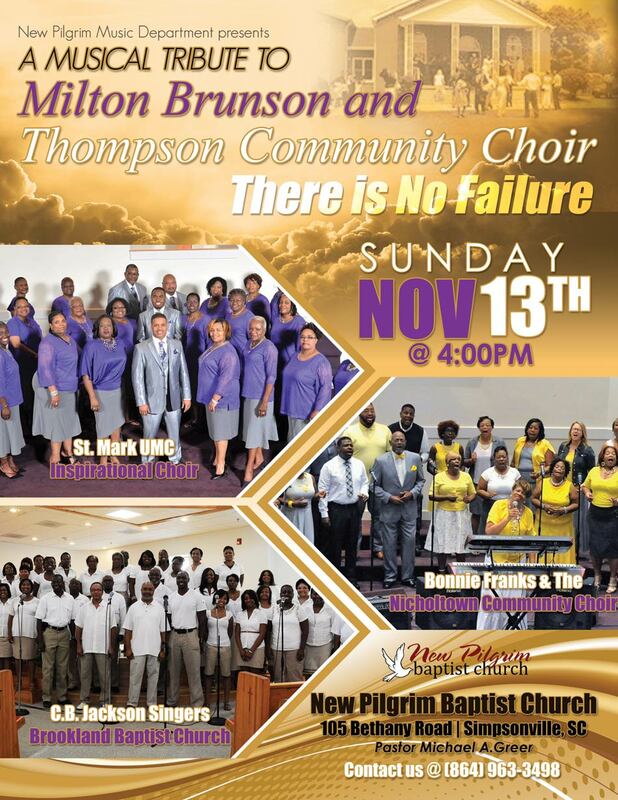 Milton Brunson & The Thompson Community Choir - "The Tommies"
Coming soon...the New Pilgrim Sanctuary choir will present "A Tribute to Rev. Milton Brunson & The Thompson Community Choir".... Why celebrate this great choir? In 1948, the Reverend Milton Brunson organized a mass gospel choir at Chicago's McKinley High School. The Thompson Community Singers--affectionately known as "The Tommies"-- emerged as the nation's oldest existing community choir, for more than 50 Blessed Years. In the interim, Brunson and his singers became one of the most honored gospel groups of their era, issuing eight gospel chart-topping albums and winning a Grammy award in 1995. Their 50th anniversary was also celebrated with the opening of a post office named in Brunson's honor. The "Tommies" are best known for songs such as "God Will Take Care of You", "My Mind is Made Up", For The Good of Them, "Safe In His Arms", and many, many more amazing songs that church choirs still perform today. Last year, New Pilgrim honored the great Walter Hawkins, a legend in his own days. This year, we will celebrate the techniques of one of the greatest, Milton Brunson, on November 13th, 2016 at 4:00 PM. Come join us at New Pilgrim Baptist Church as we worship in song, remembering the legend with the New Pilgrim Sanctuary Choir, Bonnie Franks and the Nicholtown Community Choir, Harold Brooker and the Charles B. Jackson Singers (Columbia, South Carolina) and the St. Mark UMC Inspirational Choir. The New Pilgrim Sanctuary Choir will stand under the direction of Mr. Michael Young, member of the Tri-City Singers. For more information, please contact New Pilgrim Baptist Church or Nikki Williams at 864-363-3908.